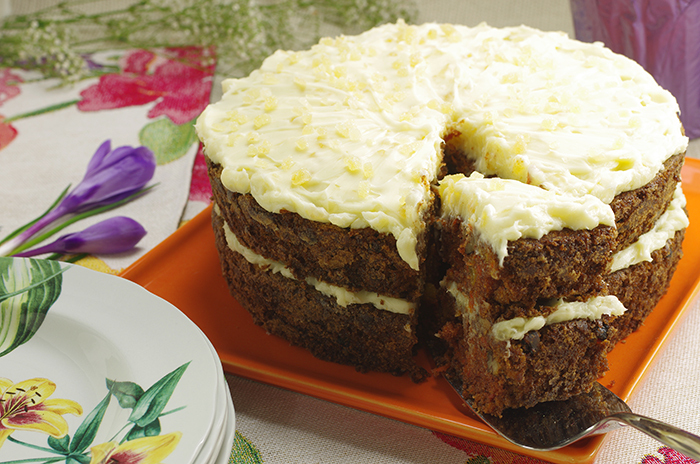 Rich carrot cake filled with raisins and nuts may be old-fashioned, but that’s exactly what I like about it. I decided to update it by adding Italian mascarpone and some spicy crystallized ginger to the frosting. What a great combination that turned out to be! Preheat the oven to 400 degrees. 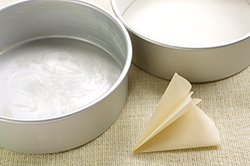 Grease 2 (9 X 2-inch) round cake pans, line the bottoms with parchment paper, and grease and flour the pans. 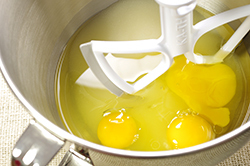 In the bowl of an electric mixer fitted with the paddle attachment, beat the sugar, oil, and eggs on medium-high speed for 2 minutes, until light yellow and thickened. Stir in the vanilla. In another bowl, sift together the 2 cups of flour, cinnamon, baking soda, and salt. 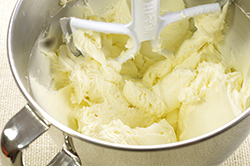 With the mixer on low, slowly add the dry ingredients to the wet ones. 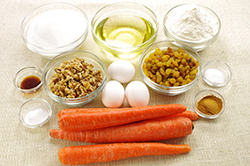 In a medium bowl, toss the carrots, raisins, walnuts, and the 1 tablespoon of flour. 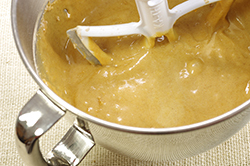 Stir into the batter with a rubber spatula. 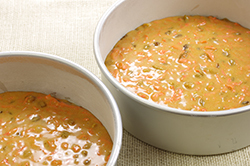 Divide the batter between the prepared pans and smooth the tops. Bake for 10 minutes, lower the heat to 350 degrees, and bake for 30 to 35 minutes, until a toothpick comes out clean. Cool in the pans for 15 minutes, turn out onto a baking rack, and cool completely. 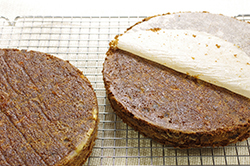 Place one cake on a flat serving plate, rounded side down. Spread half the frosting on the top (not the sides). 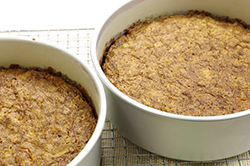 Place the second cake on top of the first cake, rounded side up. Frost just the top of the second cake. 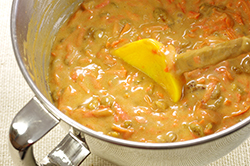 Sprinkle with ginger and serve at room temperature. 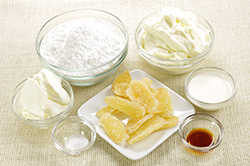 In the bowl of an electric mixer fitted with the paddle attachment, beat the mascarpone, cream cheese, confectioners’ sugar, cream, and vanilla together for about 1 minute, until light and fluffy. 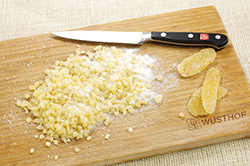 Add the crystallized ginger and salt and beat for 30 seconds more. 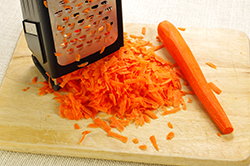 *Note: Grate the carrots by hand on a box grater; if you grate them in a food processor, the carrots will be too wet and the cake might fall. Recipes from Barefoot Contessa Foolproof by Ina Garten. Copyright 2012. Published by Clarkson Potter/Publishers, and imprint of the Crown Publishing Group, New York, NY. Reprinted with permission of the publisher. All rights reserved.